How do I replace the waste toner unit on my C522 laser printer and where do I find it? I have just recently renewed all the cartridges. available in your printer manual. If you don't have this to hand it might be worth contacing Lexmark for further assistance. We've got a cheap price commitment so that you only get amazing discounts on any Lexmark C522 toner so you do not have to go and shop at really expensive electronics stores Cartridge Save intend to meet the needs of each and every shopper by giving you low costs on every high quality Lexmark C522 toners cartridges which will work reliably every single time you print. Here at Cartridge Save you receive speedy and free delivery on Lexmark toner. You can start saving right now and get value Lexmark C522 toner cartridges by using Cartridge Save's online shop. Cartridge Save have an top rated customer care team that will make sure your order for Lexmark C522 toner is a fast and also easy process. Don't forget that Lexmark C522 laser printer cartridges supplied by Cartridge Save are also guarded with a no quibbles cash back guarantee which enables you to claim a 100% refund if you are unsatisfied with a flawed product. For the ultimate bargain for Lexmark C522 laser toner cartridges order right now with Cartridge Save. The Lexmark C522 is a dependable printer to meet the demands of a busy office that needs to complete works in colour or black and white. This colour laser printer produces 20 pages per minute whether it is in black and white or colour. To create better photos, the Lexmark C522 combines 4800 Colour Quality technology with their printer to allow you to enhance images and get more true-to-life colours. The C522 can produce photos in an amazing resolution of 1,200 dpi by 1,200 dpi that will allow photographers to use this printer as well. To keep up with print information, the Lexmark C522 uses a 312.5 MHz processor and 128 MB of RAM. This printer has measurements of 43.94 cm in width, 51.30 cm in depth, and a height of 48.51 cm. This is not a lightweight printer because it weighs 25.90 kg, but it is built to last. The installation process is done by inserting a CD and connecting to your computer using USB or an Ethernet cable. This printer is also designed under stringent guidelines to meet energy efficiency standards uses a sleep mode setting to save electricity. Lexmark C522 toner is easily installed through a front door and requires no tools. The C522 also creates a sound level of 51 decibels during operation and 32 decibels during idle. This printer can be upgraded to 640 MB of RAM to improve printing efficiency and speed. The Lexmark C522 comes with a 100-pin memory expansion slot that makes upgrading quick and simple. In addition, the C522's monthly cycle duty is 45,000 pages. 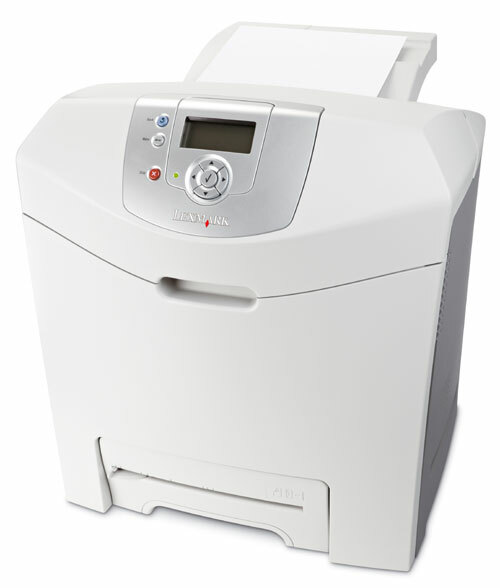 This printer also prints on various media such as labels, cards, envelopes, transparencies, and plain paper. Yet another great advantage to the Lexmark C522 is it serves as a central printer server and can be used by different computers if they are connected in a network. Lexmark C522 toner will make using your printer expensive if you are printing very frequently, but it can be purchased for less on Cartridge Save. This printer is only a single-function unit that does not come with a scanner or a copier. However, the speed that this printer can deliver quality photos at is unmatched by other printers in its class and would be a good choice of printer for anyone who demands quality.